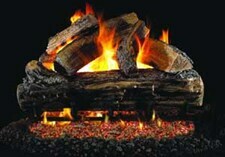 Peterson Real Fyre gas logs are available in many different series. Each is a beauty in its own way and with so many choices, it may be hard to narrow your selection down to just one set. To help choose the best set for your home, it may be helpful to understand the differences between their three series of vented gas logs - Classic, Designer and Charred. The entry level to Peterson gas logs. The Classic look that made Peterson famous. Simple styling that's ruggedly handsome and environmentally friendly. The same rugged look of the Classic Peterson logs but with more natural color and bark details. 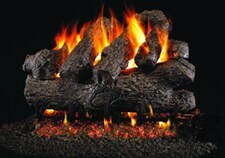 Notice with the Designer series, the ends of the logs and the split pieces are a different color than the bark giving a much more realistic appearance. The Charred series offers the ruggedness of all Peterson logs, the color and detail of the Designer series and amazing burned through realism. 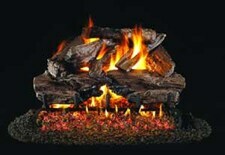 Enjoy the beauty of the burned through front log to see more flames and embers and give the appearance of a fire that has been burning all day.